How to play hi-res music on your iPhone | What Hi-Fi? While Android smartphones in recent years have natively supported high-resolution audio, there has been no sign Apple officially has plans to do the same with its iPhones. That’s a shame, as we’ve found iPhones to be the best-sounding smartphones around. They consistently outperform rivals smartphones in terms of pure audio quality, and being able to play better-quality recordings would certainly be a bonus in our eyes. Apple may not have made it official, but we wondered: is there was a way we could turn our iPhone into a hi-res music player? As it happens, there is – but to say Apple doesn’t make it easy is an understatement, and you'll need to buy a compatible DAC. If you’re determined to get your hi-res music library playing on your iPhone, here’s everything you need to know. What music files can your iPhone play? Let’s start with what the iPhone can do out of the box. Apple iTunes and Apple Music - the native music players across laptops and iPhones respectively - can play MP3, AAC, ALAC, WAV and AIFF audio files. It can't natively play DSD files, and despite FLAC support being listed in the specs since from the iPhone 8 through to the new iPhone XS models, Apple doesn't natively support FLAC files. You certainly can't play any FLAC music through Apple Music or the Files app. So how can the iPhone play hi-res music? The first thing to know is the lack of hi-res playback isn’t to do with hardware - it’s software-related. The iPhones themselves are capable of playing hi-res tunes, but Apple’s own iTunes and Apple Music software don’t allow full playback of these hi-res files. This means you just need the right software - an alternative music playing app - that will play hi-res files on your iPhone. Simple, right? Predictably, it’s not that straightforward with Apple. When you’re listening to music on, say, the iPhone 8 Plus via the Lightning connector, you bypass the iPhone’s internal DAC entirely. You’d think this means we’d be able to play hi-res files unobstructed, but even then we hit a snag. If you’re listening to your iPhone using the Lightning-to-3.5mm adapter that comes bundled with new iPhones, the output is limited to 48kHz files. This makes things a tad complicated, but the solution here is to connect an external DAC, such as the Cyrus soundKey or Chord Mojo. Not the most elegant solution, but if you want to hear the full original resolution of your hi-res files through your iPhone, using a DAC is the way to go. The alternative to a DAC is to plug Lightning connector headphones straight into your iPhone, although many pairs' DACs are limited to a 24-bit/48 kHz output. So, you've got your DAC or Lightning headphones. And now you need an iOS app that will play hi-res music. In the past few years, dozens of apps have cropped up on the App Store that claim to play hi-res files (and especially the popular FLAC lossless compression format), but we narrow our choices down to those that support a wide variety of formats, read metadata accurately and, ideally, show us what file format and sample rate is playing. This last bit is crucial, because if the app can’t (or won’t) show you the resolution of the file, how do you know exactly what is being played? A surefire way to check that your hi-res file is being played through intact is to connect it to a DAC such as the Audioquest DragonFly Black, the Chord Mojo or Chord Hugo 2. Why? Because these DACs usually have ways of indicating what sample rate is being played. Neat and useful. We split our testing between the latest iPhone 8 Plus and the older iPhone 6S, both updated to the latest iOS 11 update (11.2.6 at the time of writing). As for the hi-res music, we use a mixture of FLAC and WAV files, ranging from 24bit/44.1kHz to 24bit/192kHz, as well as DSD 2.8MHz files. What are the best apps to play hi-res files on your iPhone? Of the seven iOS apps we put to the test (Onkyo HF Player, Vox: MP3 & FLAC Music Player, TEAC HR Audio Player, Flacbox, Musicloud, FLAC Player+ and VLC for Mobile), two come out on top: Vox and Onkyo. Vox is our favourite. With its stylish interface, ability to play all popular hi-res formats and excellent metadata support, it’s a lovely app to use. The visuals are appealing, and it’s a breeze to navigate. 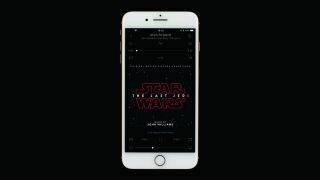 You can even pull together music from your iPhone’s library, SoundCloud and Spotify Premium account to create new playlists. Best of all? It’s entirely free to download and use - though there is a subscription tier if you want to use its unlimited cloud storage and other perks. Onkyo HF Player is our second choice, mainly because you have to pay an additional £10 to unlock its hi-res ability. This might sound steep, but it’s a one-off payment and the app is reliable, easy to use and has plenty of functions worth paying for. There are various audio and player settings, including upsampling modes, choosing output formats for DSD files, equalisers and more. File support is huge - it can even play quad-DSD - and it keeps your hi-res files separate from the rest of your iPhone music collection. We particularly like how the app shows both the original sample rate of the audio file and the actual rate being played. It’s what tipped us off about using a DAC to hear the full resolution through an iPhone. The rest of the apps we tested are either awkward to use, lack metadata support or, in some cases, downsample the hi-res file to CD quality. The TEAC app is one exception. Based on an older version of the Onkyo app (they’re owned by the same company), the TEAC HR Player doesn’t sound quite as good and we prefer the slicker interface of the Onkyo app. How do I transfer hi-res files to my iPhone? Now comes the fun part: you've got your new music playing app, and it's time to transfer your hi-res files on to your iPhone. Luckily, this is the easiest bit. If your hi-res files are stored on your computer (as they’re likely to be if you use download sites such as 7digital and Onkyo Music), then you can do it all through iTunes. Plug your iPhone into your laptop, fire up iTunes and click on the little iPhone icon that pops up on the top left to see all your phone’s settings and apps. Head to the File Sharing tab (you’ll need to be on the latest iTunes software to see this option) and there, you’ll find a list of apps that allow you to transfer files on to your iPhone. Select your chosen app, then drag and drop hi-res files from your laptop to the app folder. Press Done, and you’re all set - the files should show up in your iPhone app. So now you know how to store and play hi-res files on your iPhone, here's the alternative method of accessing hi-res files: streaming. Two years ago, music streaming service Tidal launched Tidal Masters: hi-res MQA streams, available at no extra cost to subscribers of its £20 per month HiFi package. It was first made available through Tidal's desktop app, and then through direct hardware integration on select MQA-ready products (such as the Bluesound Node 2 streamer). In January this year during CES 2019, Tidal announced Masters support for the Android app. And now, Tidal has finally expanded Masters support to the iOS app, compatible on Apple devices running iOS 11 or later. Like the Android app, the iOS app can complete the first 'unfold' of MQA file decoding, outputting streams up to a maximum of 24-bit/96kHz. Voila! You can go one better. To entirely unpackage an MQA stream for playback, and therefore give you a more accurate representation of the file based on your system characteristics, you can connect your Apple device to an MQA-compatible DAC, such as the AudioQuest DragonFly Red, and thus take the decoding process away from the software (iOS Tidal app) and into the DAC's hands. Still, even without an MQA-compatible DAC, Apple owners will be able to benefit from the app's 96kHz (or below) output. Just remember that you need either hi-res-capable Lightning headphones or a DAC to benefit, as the output restrictions of the Lightning-to-3.5mm adapter is limited to 48kHz. How does hi-res music sound on the iPhone? Of course, all of this is pointless if there’s no obvious sonic advantage to listening to hi-res music on your iPhone. We’re happy to report that a hi-res file on Vox is quite clearly a step up in performance - subtler detail, better timing and more expressive dynamics - compared with the same song downloaded in Apple Music (256kbps AAC). But between the Vox and Onkyo apps? It’s a far closer comparison. We find Vox offers a tad more subtlety and rhythmic punch compared with the Onkyo - it’s just more fun and expressive to listen to. More importantly, both sound better than Apple’s native Music player. As for Tidal Masters hi-res streams, we'll be testing them very soon, so watch this space. What kit will I need to listen to hi-res files? As always, you’ll need the appropriate kit to really get the best out of this arrangement. A good pair of headphones, such as the AKG Y50, Sennheiser Momentum 2.0 or Grado SR80e, and a decent DAC (the aforementioned Audioquest DragonFly Red, Cyrus soundKey and Chord Mojo, say) should be your starting point. Don’t be afraid to build up to a more revealing system, though: we used the Chord Hugo 2 DAC and Beyerdynamic T1 Generation 2 headphones during our testing, and while that may be a touch overkill and punishingly transparent for an iPhone, don’t forget you’re investing quite a lot in buying hi-res albums. It’s worth it. You’ll also have to bear with the awkwardness of adding the Lightning-to-USB camera adapter (£29) when plugging in an external DAC to the iPhone, but it’s a small price to pay for finally being able to enjoy hi-res music on your iPhone. If you're going down the Lightning connector headphone route, plugging them straight into your iPhone, check what resolution their DAC can handle. The DAC inside the Philips M2L and Libratone Q Adapt In Ear, for example, is limited to 24-bit/48 kHz.